The first 24.XII.2010 version was only PROVISIONAL. Some points were still eratic, missing or duplicated. We fixed most of these problems. Important data sources are now included: ICELAND, HUNGARN, BULGARIA, CZECH REPUBLIC, AUSTRIA, NORWAY, IRAN and some parts of the BALKAN. We hope that you will already be happy to see that all these data that you sent are well used. The 9.XII.2013 version improves a lot of data sources, specially in N-Russia, Ireland, Norway, Sweden. Updates 29.VIII.2014 concern Bombus gerstaeckeri (discovered in collection from Poland), B. lapponicus and B. monticola. This map summarizes the data already used. It includes 917,995 data. BDFGM (P. Rasmont & E. Haubruge) 424,478 data; BWARS (UK, S.P.M. Roberts) 109,356 data; SSIC (Sweden, B. Cederberg) 97,440 data; Austria (J. Neumayer) 90,053 data; EISN (Netherland, M. Reemer) 76,427 data; CSCF (Suisse, Y. Gonseth) 40,810 data; Poland (T. Pawlikowski) 21,734 data; NBDC (Eire, U. FitzPatrick) 15,358 data; FMNH (Finland, J. Paukkunen) 14,367 data; Czech Republic (J. Straka, L. Dvorak) 10,133 data; France (G. Mahé) 6,162 data; NSIC (Norway, F. Odegaard) 4,128 data;S.P.M. Roberts 2,957 data; A. Manino 2,585 data; Spain (L. Castro) 2,255 data; WID (Belgium, D. Laget) 1,564 data; L. Baliteau 1,544 data; Gabriele 1,169 data; BUWB (website, Germany, K. Mandery) 1,115 data; M. Cornalba 947 data; Russia (N. Filipov) 849 data; UGMD 417 data; France (X. Lair) 366 data; Slovenia (A. Gogala) 268 data; Slovenia (A. Jenic) 241 data; A. Chorein 199 data; A. Bertsch (website) 196 data; Portugal (D. Baldock) 190 data; France (Bailey S.) 122 data; M. Quaranta 117 data; ALARM 98 data; France (D. Roustide) 62 data; Slovakia (P. Sima) 58 data; Lituania (E. Budrys) 27 data; R.Barbattini 26 data;T. Petanidou 21 data; F. Burger 11 data. Litterature data: 329,837 data (Rasmont 1988 is included in the BDFGM dataset). Alanen, 2009; Alford, 1981; Amiet, 1996; Bäckman & Tiainen, 2001; Bak & Pawlikowski, 2007; Ban & Sarospataki, 2007; Banaszak, 2010; Barbattini et al., 2007 ; Bolotov & Kolosova, 2006; Brodie, 1996 ; Elfving, 1968; Filipov, 2012; Gabriele et al., 2008; Graziano, 2002; Intoppa et al., 1995; Kells et al., 2001; Kristiansen, 2006; Krzysztofiak & Krzysztofiak, 2010; Kuussaari et al., 2008; Løken, 1973, 1984; Mänd et al., 1999; Meyer, 2007; Monfaret et al., 2007; Monsevicius, 2004; Obeso, 1992; Oertli et al., 2005; Ornosa Gallego, 1984; Panfilov, 1978, 1981; Pawlikowski & Drzewiecka, 1996; Pawlikowski & Hirsch, 2000, 2002; Pawlikowski & Leski, 1995; Pawlikowski & Pajak, 1995; Pawlikowski & Pokorniecka, 1990; Pawlikowski & Rajkowska, 1996; Pawlikowski, 1989; Peeters et al., 1999; Pekkarinen et al.,1981; Pekkarinen, 1979; Piazza et al., 2001; Quaranta et al., 2004; Sattler, 2009; Saville et al., 1997; Svensson, 1979; Teras, 1976; Theunert, 2003; Walter-Hellwig & Frankl, 2000a; Westphal et al., 2006. * Bees, Wasps & Ants Recording Society (BWARS): Dicker GHL; Nisbet G; Edwards M; Macdonald M; Else GR; Beavis IC; Eales HT; Smith MN; Macdonald MA; Collins GA; Cheeseborough I; Spooner GM; Harvey PR; Saunders P; Baldock DW; Roberts SPM; Allen GW; Gibbs DJ; Duncan K; Berman HJ; Darvill B; Farmer SFG; Clemons L; Simpson G; Wedmore RW; Jones N; Sheppard DA; Moyse RI; Hawkins RD; Smout TC; Neath B; Eales H; Cross IC; Wright IR; Steer E; Howe MA; Felton JC; Falk SJ; Howe MA & EA; Castro L; Paxton RJ; Wells L; Phillips AL; Boyd J; Madge S; Archer ME; Williams PH; McKellar J; Jukes A; Clee C; Litlle BH; Ellis J; Morris RK; Neill B; Pinchen BJ; O'Toole C; Dickson R; Beaton D; Morgan MJ; Crossley JE. * AUSTRIA: Neumayer J., Pittioni B., Küpper T., Kosior A., Fritsch K., Kopf T., Schwarz M.
* Finnish Museum of Natural History (FMNH): Paukkunen J., Valkeila E., Raekunnas M.
Bombus wurflenii is confined to the mountains and hills of Europe ; it is absent from the British Isles. and in Russia, it is known from the Ural and the Caucasus. Its presence in Finland is unlikely. As this species is rather widespread in Central Europe and Scandinavia, it has been the topic of many articles and is a rather well known bumblebee. See the synthetic article by Reinig & Rasmont (1988). All the species of the subgenus Alpinobombus are restricted to the northern tundra or the higher alpine stages of some mountains. Among them, the best known is Bombus alpinus. 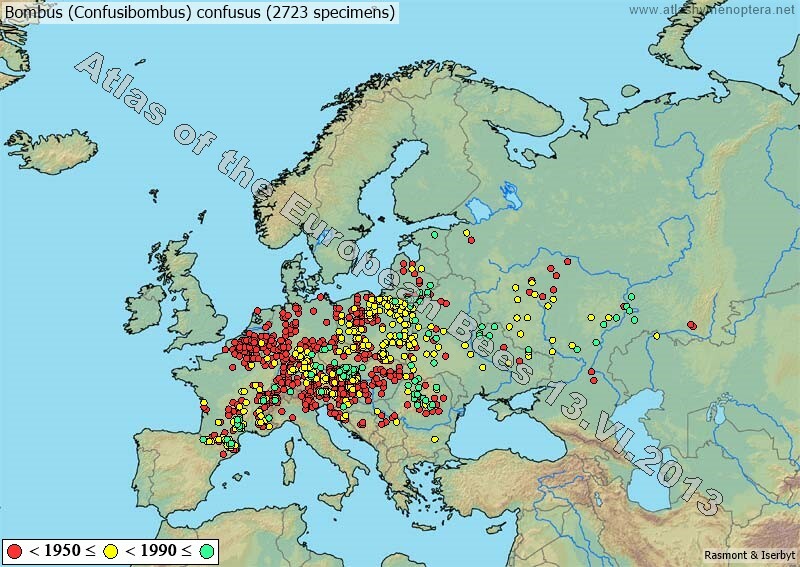 Whereas the three other West-Palaearctic Alpinobombus species are restricted to the Arctic tundra and spread eastwards to the tundra of N. Russia, alpinus is not found east of the Kola peninsula (see Pittioni, 1942), but spreads southwards to the alpine stages of the Alps and the Carpathians. 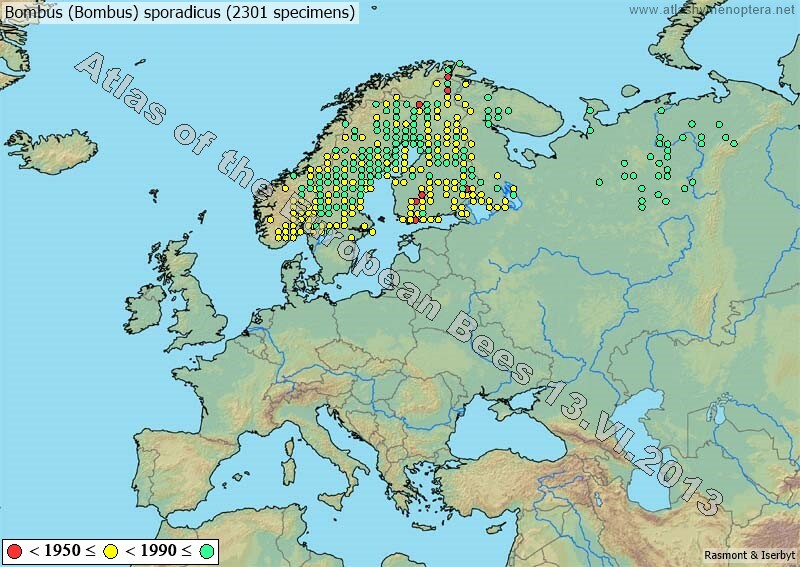 The overall range of Bombus polaris is circumboreal (K.W. Richards, 1973). This distribution reminds of that of balteatus, while being more arctic: the species is restricted to the strictly arctic milieu. In N. America, it stays north of the 60th parallel, except in a few places in Labrador, on the Hudson Bay and in Quebec, but always beyond the tree-line. It is also found in the islands islands : on Baffin and Ellesmere, and even on the far north of Greenland, i. e. well above the 80° N.
In continental Russia and Siberia, it is restricted to the coast of the Arctic Ocean. It is also present on Novaia Zemlia, Wrangel and some other Siberian islands (Berezin 1995). As in Greenland, polaris can be found up to the 83rd parallel. Bombus polaris is subject to inquilinism from B. hyperboreus, but this species is generally rarer and still more restricted to the colder regions. Bombus hyperboreus is uncommon in the collections and mentioned in few writings. The species lives beyond the tree-line and on the alpine stage of the Scandinavian mountains, at latitudes nowhere lower than 60° N. Its distribution is more strictly Arctic than for B. polaris and in N. America, it is absent from the shores of the Hudson Bay, as from Quebec and Labrador, but reaches the far north of Ellesmere Isl. and Greenland, well beyond the 80th parallel. In the West-Palaearctic region, the range of B. hyperboreus is the same as that of B. polaris, including Novaia Zemlia, Wrangel and some other islands of northern Russia and Siberia. However, it is always less common than the latter species. The inquiline behaviour of hyperboreus is quite remarkable : this is the only bumblebee species, out of the Psithyrus, for which inquilinism is a well documented practice. In N-Canada, Greenland and Novaia Zemlia, B. hyperboreus appears as a workerless obligate parasite (K.W. Richards 1973, Löken 1973). In Norway and in Wrangel island, some queens of this species are able to forage and to produce some workers, even if most queens act as inquilines (Löken 1973, Berezin 1994). B. cryptarum is hard to recognise and has been regarded as a valid species only recently - and then not by everyone. This explains why it has been explicitly dealt with in rather few articles. For Rasmont (1984), B. cryptarum is a rather continental species. It has been found as far east as the Ussuri (E. Siberia) (Rasmont et al., 1986). In the west, it is absent from the Pyrenees and the Iberian and Italian Peninsulas. It has been found only recently in the British Isles and in Ireland. Along the Atlantic coast, B. cryptarum often coexist with B. magnus, both species being difficult to separate. North of the 45th parallel, populations live in the plains, mainly in the Ericaceae heather ; more south, it is a mountain species. 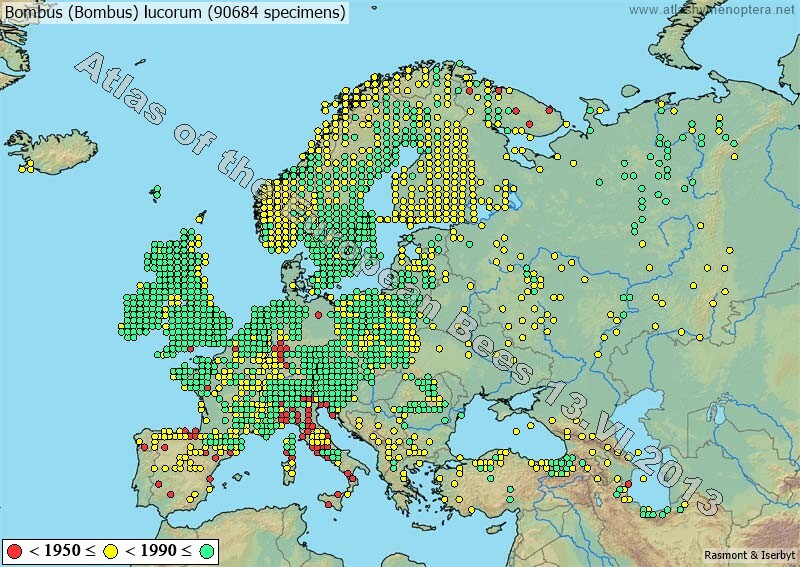 Concerning N. Europe, few ecological data are available. The species may exist up to the north of Fennoscandia. According to Pamilo et al. 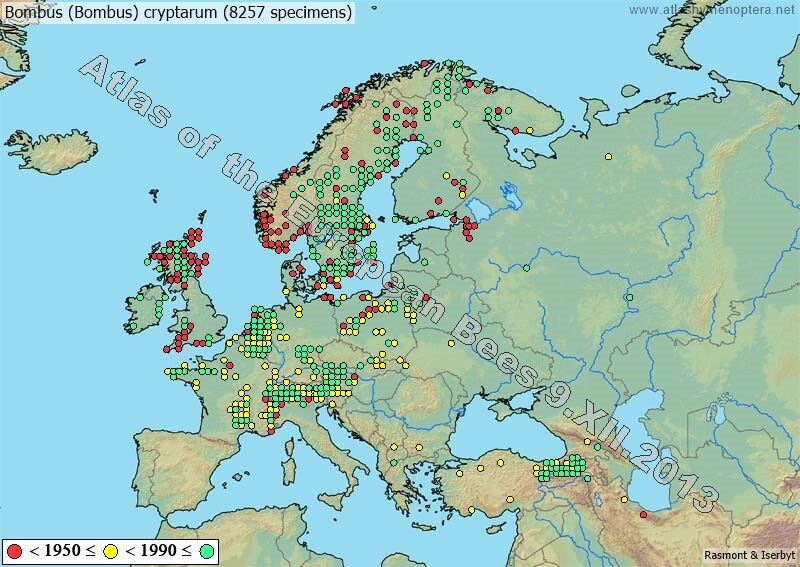 (1997) and to many personal observations, B. cryptarum may totally supplant B. lucorum north of the Arctic Circle. Bombus magnus has been the topic of many discussions. It belongs to the same group as B. cryptarum and B. patagiatus, with a rather homogeneous morphology. As the species has been described recently and is difficult to recognise, it has been the topic of rather few articles. B. magnus seems the most abundant in the Atlantic region.. The species could be common in the maritime moors, from central Portugal (Serra de Estrela) to Narvik, in Norway. Contrarily to B. cryptarum, it is present in the Pyrenees, and in the Iberian Peninsula. (Rasmont, 1984). It is less common eastwards, far from the Atlantic, though it has been found in a few places in S. Finland (Pamilo et al., 1997) and in Poland (Banaszak & Rasmont, 1995). Scattered specimens are found even more east, the most oriental locations being near St Petersburg and Moscow. Still more eastern findings could be related to other species. 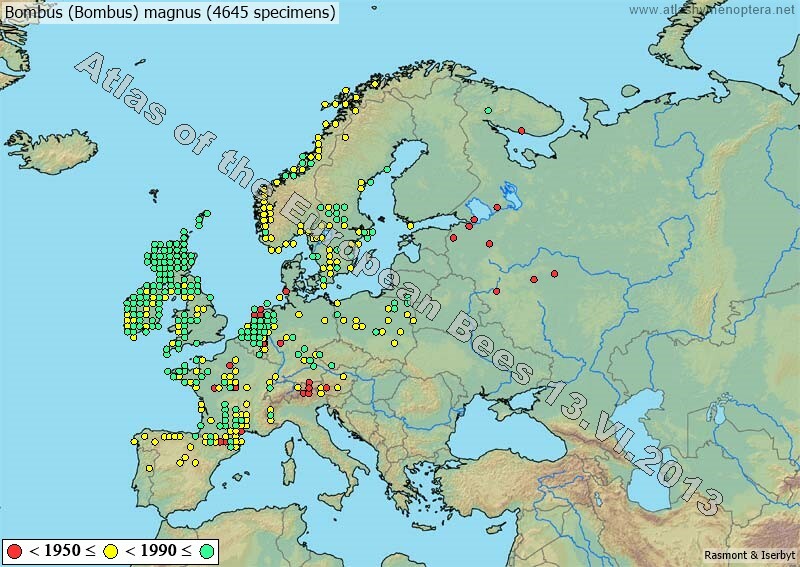 B. magnus has not been found in the Balkan, nor in Asia Minor. The most western collections are from the region of Petrozavodsk, near Lake Onega, in E. Carelia (Russia) (Pekkarinen et al., 1981). From the map drawn by Tkalcu (1967), we can see that there were hardly more observations west of the Ural. Krüger (1956) mentions a few places in the Perm region. The species is also known from the regions of Moscow, Ivanovo, Kirov, Ul'yanovsk and Kazan. According to Tkalcu (1967), B. patagiatus "extends its range over the whole taiga of the former SSSR, to the Ussuri, Sakhalin and Korea, but is absent from Kamchatka and, most probably, from Japan. The northern limit of its range lies clearly south of the northern borderline of the taiga. " B. terrestris is common in a large part of Europe and has been successfully domesticated since 1987. 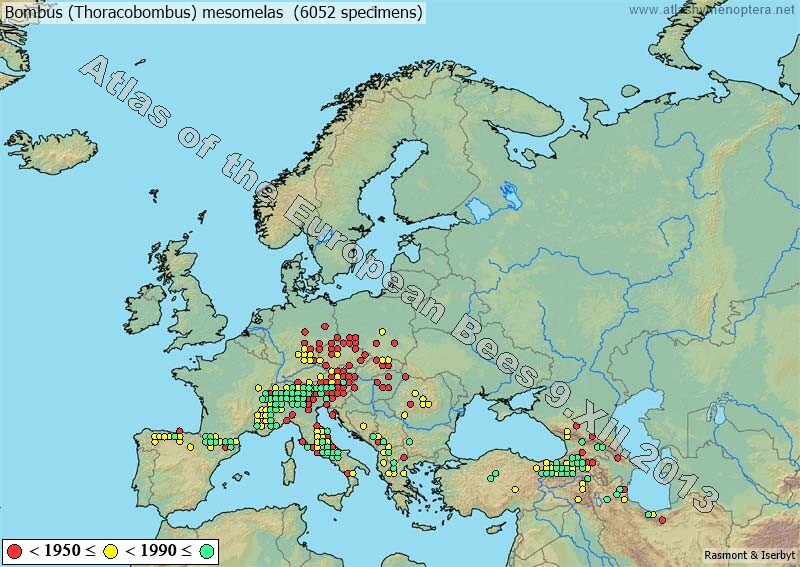 Bombus terrestris is the only bumblebee species with a Mediterranean-centred distribution: the only country of the region from which it is absent is Egypt. It is not restricted to this region, however: to the north, it extends to the latitude of Stockholm and east, to the Altai but it is absent from the alpine stage, the deserts and the arid, subdesertic steppes. 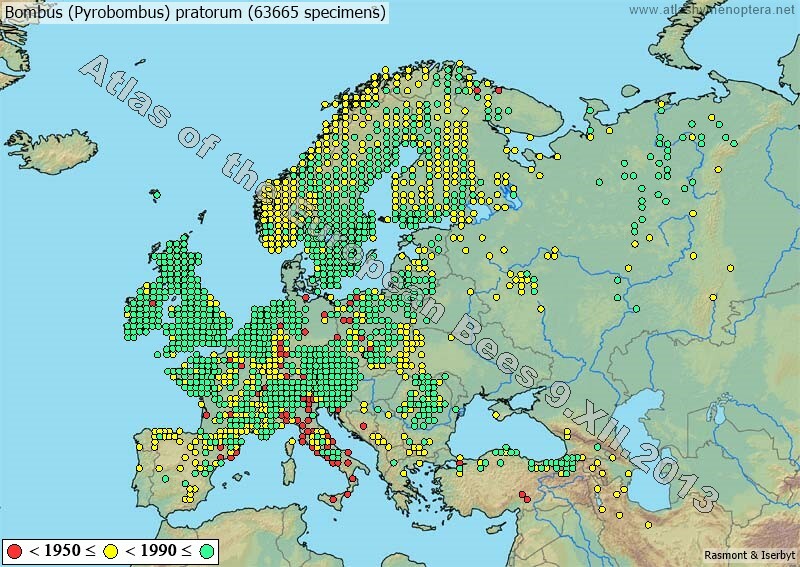 Bombus terrestris evolved into well differentiated subspecies (audax in British isles, canariensis in Canary Islands, sassaricus in Sardinia, xanthopus in Corsica, africanus in N. Africa, dalmatinus in the SE Europe and Near-Orient, lusitanicus in Iberian peninsula, terrestris in the remaining W. and Central Europe and in S. Scandinavia). Some of the insular subspecies are that particular that they have been considered as true species by some authors. Please remark the recent data from Azores islands (Isl. Flores, leg. P. Noger 2010), S-Iran (Shiraz, leg. N. Shagei, 2007), N-Sweden not far from the Arctic Circle (Ragvaldsträsk, leg. E. Sjödin, 2008). All data from Lybia are ancient (Cyrenaica, Gribodo 1925). The distribution of Bombus confusus is centred on Central Europe. The species does not reach the Mediterranean peninsulae, nor the Mediterranean sea coast. It includes two very differentiated subspecies that could even be seen as species. The distribution of B. confusus paradoxus is much more restricted than the one of confusus s.s. The only recent observation of this subspecies are from Russia. Three widely allopatric taxa are often considered as mere subspecies of Bombus cullumanus (Kirby): cullumanus s.s., apollineus Skorikov and serrisquama Morawitz. 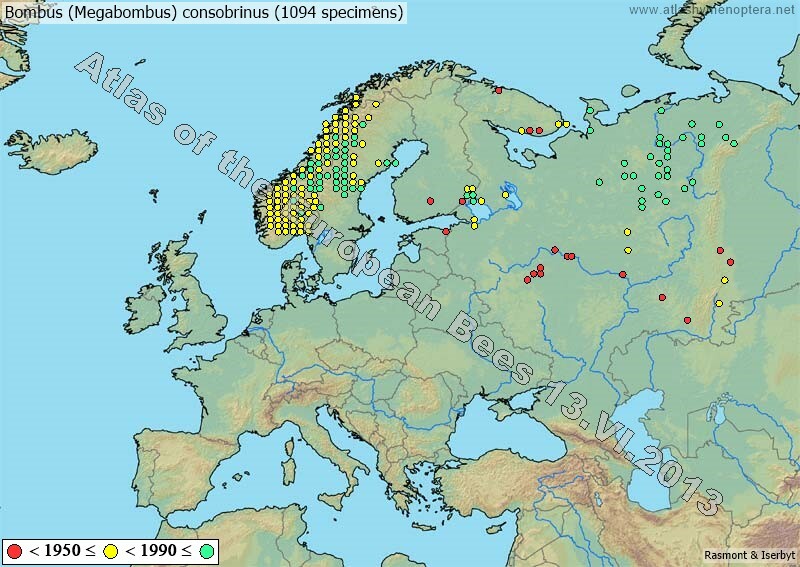 Bombus cullumanus cullumanus has an Atlantic distribution, but is uncommon to very rare throughout its range. Formerly, it was found in the most southern part of Sweden, in Denmark and N.-W Germany, in the Netherlands, in Belgium, in England, in N. France and the Paris region and (with some doubt) in the French Alpes-Maritimes. Nowadays, the last stations where the species has been observed are restricted to the Massif Central and the Pyrenees (including their Spanish side) (Rasmont, 1988). No one specimen have been observed since 2004. The range of Bombus cullumanus apollineus is restricted to E. Anatolia, Transcaucasia and N. Iran. We had no access to specimens from the Caucasus and did not find any reference to this region. The range of B. cullumanus serrisquama is very large but discontinuous. The western part of it includes the steppic plateaus of N. Spain; more east, the species is found in the steppic regions extending from Hungary (near Budapest) to the north of the Altai (near Biisk). A southern part of the range includes the steppic foothills of S. E. Kazakhstan, E. Uzbekistan, Tadzhikistan, Kirgiztan and Afghanistan. Tkalcu (1969a) considers Bombus praemarinus Panfilov, from the Vladivostok region, as a synonym of B. serrisquama; this would extend the range of the species to the Pacific coast. The displayed map includes some dubious or ancient locations. The most northern one, in the Arkhangelsk region is imprecise. One finding on the Elburz (Reinig, 1939b) is regarded by Baker (1996) as unlikely. However, the recent discovery of B. serrisquama in N.-E. Turkey (Özbek, 1998) makes this observation much more likely. The first author found again serrisquama in this region in 2011. Most data are ancient and the present status of the species is worrying. Main sources : BDFGM; P. Rasmont orig. data; Panfilov, 1951; Ozbek, 1983, 1998. The information on B. semenoviellus is rather scanty. Until recently, it had been found between the 50th and 65th parallels, from Lithuania in the west to the Okhotsk sea in the east. Quite recently (12.VIII.1998), Mrs Jane van der Smissen collected a male, on Cirsium sp., at Lübeck-Walkenkrug, 53°55'N 10°44'E (Schleswig-Holstein, N. Germany) (van der Smissen & Rasmont, 2000). More specimens have been collected here and there in Germany. 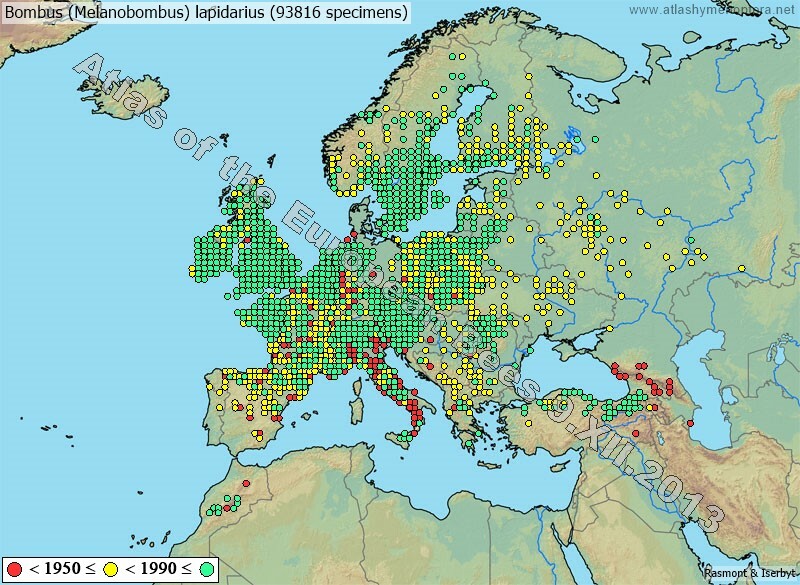 It has also been found in Czech republic, in Estonia, in Latvia and in Poland. In Finland, it is extending its distribution westwards and northwards. Bombus soroeensis is present, and locally very common, in a large part of the West-Palaearctic region. It has been much published about. North, its range extends to the 70th parallel in Scandinavia and to the 60th in Russia. South, the species is present in the mountains of N. Spain, S.France, Italy and Balkan. West, it extends to the Atlantic coast in Norway, and in the Sierra de Ancares in Spain. It is absent from Ireland and from the Hebrides, but present throughout the British mainland. East, its range extends to the south of central Siberia (around Lake Baykal) and to Mongolia. South-east, in Anatolia, it includes the Taurus, the mountains in the north of the Hakkari province, the Caucasus and the mountains of N. Iran, except the Kopet-dag. B. soroeensis includes several well differentiated subspecies that makes its identification sometimes tricky. B. argillaceus is a typical East-Mediterranean species. Its distribution has been drawn by Reinig (1939) and may be compared with that of its sister-species B. ruderatus in fig. 40. To the west, the range of B. argillaceus extends in France to the upper valleys of the Alps and in Switzerland to the upper Rhone. It is found throughout N. Italy and in most of the Austria. The northern limit of its range runs through Slovakia. In Hungary, it is found everywhere. In Romania, it extends to the region of Cluj. It has been found in Moldavia and in Russia up to Kursk and Volgograd. To the east, Skorikov (1931) mentions it from E. Kazakstan. South and south-east, B. argillaceus is found throughout the Balkanic Peninsula, in Creta, Cyprus, Turkey, Caucasus, Transcaucasia and N. Iran, including the Kopet-Dag. Despite ancient erroneus citations, the species is totally absent from the Iberian Peninsula. 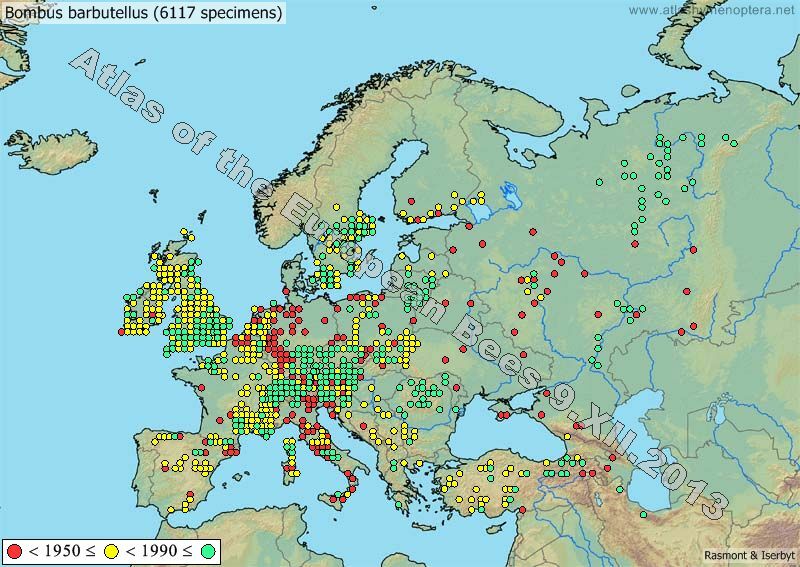 There may be a geographical exclusion between B. argillaceus and B. ruderatus ; however, there are restricted zones of sympatry, as in some valleys of S. France and Switzerland and in Hungary. Bombus consobrinus is a typical taiga species. According to Løken (1973), its range is entirely included in that of the plant genus Aconitum, i. e. , in Fennoscandia, between the 59th and the 69th parallels. In Russia, the species extends more southwards : to the 51st parallel in the region of Saratov (Efremova, 1991) (fig. 42). In Asia, the species is found throughout Siberia, to the Kamchatka, in Mongolia, in the Gan Su Province (China), in Manchuria, Korea and Japan. The distribution of B. gerstaeckeri is restricted to the southern mountains where it is highly patchy: by places, the species may look common, but then, most specimens are from the same locality. Like Bombus consobrinus, Bombus gerstaeckeri forages mainly on Aconitum spp. It seems still more specialized to these foraging plants. Ponchau et al. (2006) stressed that the species could show a very low number of worker in some stations. They hypothesized that it could even live in a solitary way, while obviously most queens continue to forage themselves during the whole season. These authors also measured population densities of this species that are extremely low. Bombus portschinsky is found only in N.-E. Anatolia, in the Caucasus, Armenia and N. Iran. The species is restricted to the Spanish Sierra Nevada, where it is very uncommon. This bumblebee has the smallest geographical distribution of all the West-Palaearctic species. B. ruderatus is common in western Europe, specially in its Mediterranean zone. In latitude, its distribution ranges from the Moroccan Atlas, N. Algeria, N. Tunisia and S. Italy to the south of Sweden, Lithuania and Belarus. To the west, the species extends to the whole Iberian Peninsula, Madeira, the Azores, and England. It is very rare in Wales and probably absent from Ireland. The eastern limit of its range is less clear, though it includes Poland, Hungary and Slovakia and seems to reach Ukraine. Efremova (1991) mentions some findings in the upper Volga (Ulyanovskaya Oblast, Kuybyshevskaya Oblast), i. e. largely beyond the main range of the species. In S.-E. France, Switzerland, Austria and Hungary, its distribution appears to be limited by that of B. argillaceus. B. ruderatus is also present in most of the Italian Peninsula, south of Toscana. Besides, B. ruderatus has been imported in New Zealand and in Chile. Within this vast area, the species includes several subspecies. The nominal subspecies is the common form on Madeira and in the greater part of the Iberian Peninsula. B. ruderatus siculus is found in the far-south of Spain, in the north of Morocco, Algeria and Tunisia, in Sicily and the south of the Italian Peninsula. B. ruderatus perniger is found in the British Is. and is probably the origin of the populations exported to New-Zealand and Chile. B. ruderatus autumnalis lives in the larger part of W. Europe. The well differentiated subspecies corsicola and sardiniensis live respectively in Corsica and in Sardinia. Main sources : Rasmont, 1988; BDFGM; BWARS, 2010; Pawlikowski, 2008; EISN, 2010; Ornosa Gallego, 1984; Intoppa et al., 1995; Alford, 1981; Quaranta et al., 2004; Castro, 2010; Parker, 1994; Piazza et al., 2001; Mahé, orig. data; Intoppa & De Pace, 1983; Ricciardelli d’Albore, 1986; Peeters et al., 1999; Manino et al., 2010. Bombus saltuarius is found mainly in N. Russia : Arkhangelsk region, Bolshezemelskaya tundra, Pechora basin, north of the Ural Mts., but also in Asia: Sayan Mts. (Siberia) and Gan Su Province (China). B. saltuarius is the least known of the West-Palaearctic bumblebees. The most recent specimens that the authors could find in museums had been collected before 1928 and we have no information on the present situation of the species. Indeed, the region where it lives was barred by the GULAG to any natural history investigation for more than half a century. In the West-Palaearctic region, Bombus alagesianus is restricted to Anatolia, Transcaucasia, Caucasus and N. Iran. As it lives in remote places of high mountains, rather few specimens have ever been collected. Outside the West-Palaearctic region, B. alagesianus is found in the mountains of Mongolia (ssp. mongolicus) and in the Alai and the Pamir (ssp. pamirus). As the distribution centre of the species lies in central Asia, it may also be expected to be present in the Altai and Sayan Mts. Bombus alagesianus F on Astragalus xerophilus Lebed. As Bombus alagesianus, the recently described Bombus erzurumensis belongs to the Central-Asian group of Bombus keriensis Morawitz. B. erzurumensis is endemic to N.-E. Anatolia and N. Iran. We have no data from Armenia nor from the Great Caucasus. 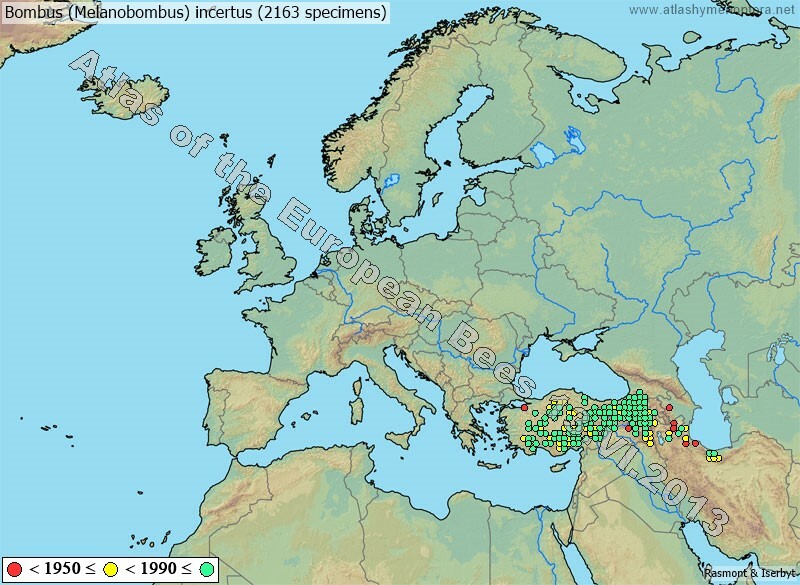 Bombus incertus is strictly restricted to Anatolia, Transcaucasia and N. Iran. It has not been observed in the Caucasus. B. incertus has not been reported from Armenia, where it is most probably present. Although it does not live at lower altitudes, B. incertus is the most commonly collected bumblebee in Anatolia. 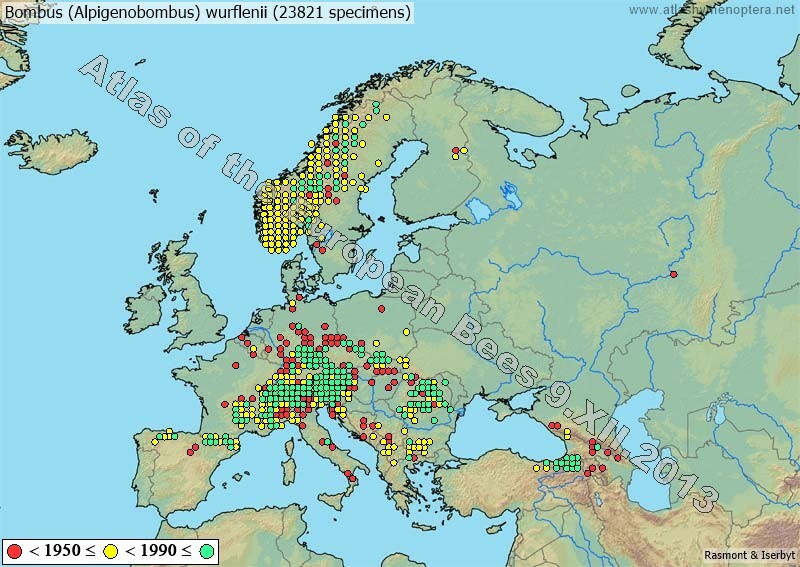 Bombus lapidarius is very widespread throughout mid-Europe. It is one of the commonest species after B. pascuorum and B. pratorum and before B. hortorum and B. terrestris. Northwards, it extends up to the Arctic Circle in Finland, but is uncommon beyond the latitude of Stockholm. Southwards, it is a common plain species down to the 45th parallel. More south, it becomes a mountain ad even alpine species. The most southern observation is in Morocco (ssp. atlanticus), in the alpine stage of Jbel Siroua (orig. data), between the High-Atlas and the Anti-Atlas. It is found in the west, in the Cordillera Cantabrica (ssp. decipiens) and in Ireland, but is absent from most of Scotland. In the east, it lives in the plains of Russia, up to the 60th parallel and, according to Panfilov (1981), it reaches Orenburg, south of the Ural Mts. The same author reports a single location in Siberia, N.-W. of Novosibirsk. South-east, B. lapidarius is present in the Caucasus (ssp. eriophorus), in N. Anatolia and in the mountains of Georgia and Armenia (ssp. caucasicus). It has not been reported from Iran. Throughout the plains of mid-Europe, the species is represented by its nominal lapidarius ssp., black with a red-tipped abdomen. The same holds for the Balkan and W. Anatolia mountains. Most of the populations from the southern mountains belong to subspecies with light-coloured stripes : atlanticus Benoist in the Atlas Mts., decipiens Pérez in the Iberian and Italian peninsulas, caucasicus Radoszkowski in N. E. Anatolia and Transcaucasia and eriophorus Klug in the Caucasus. Whereas the lapidarius subspecies is common in most of its range, the southern, more or less montane light-striped subspecies are uncommon taxa. IMPORTANT DATA SOURCES FOR THE NOMINAL SUBSPECIES (IN RUSSIA) ARE STILL MISSING ON THIS MAP (24.XII.2010). 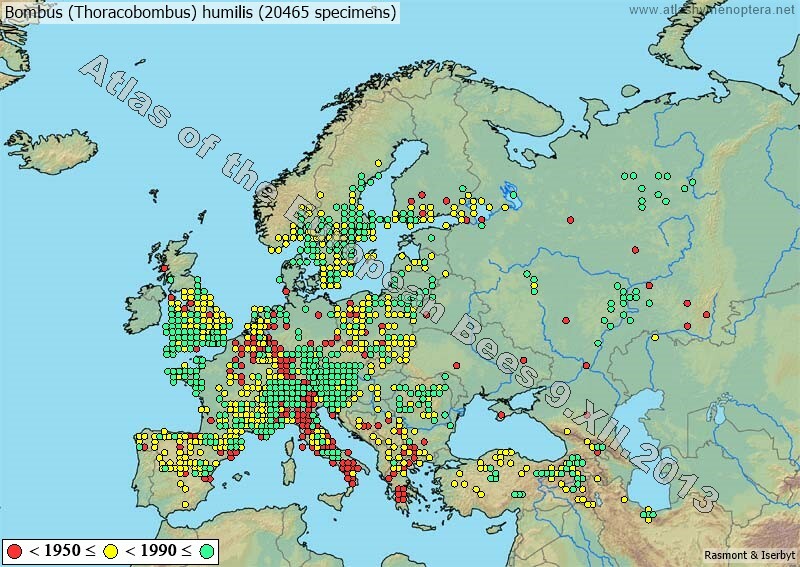 The distribution of Bombus sichelii is discontinuous. The northern limit of its range is that of a taiga species. Its most western observations are in the regions of Arkhangelsk and Ivanovo ; it does not reach St Petersburg. Eastwards, the species extends to the Anadyr and Kamchatka peninsulas. The southern part of its distribution includes various subspecies, isolated on high mountains : B. sichelii flavissimus in the Pyrenees and the western Alps, B sichelii alticola in the central and eastern Alps, B. sichelii drenowskii and dinibengis in the Balkan, B. sichelii cazurroi in N.-E. Anatolia and caucasus. 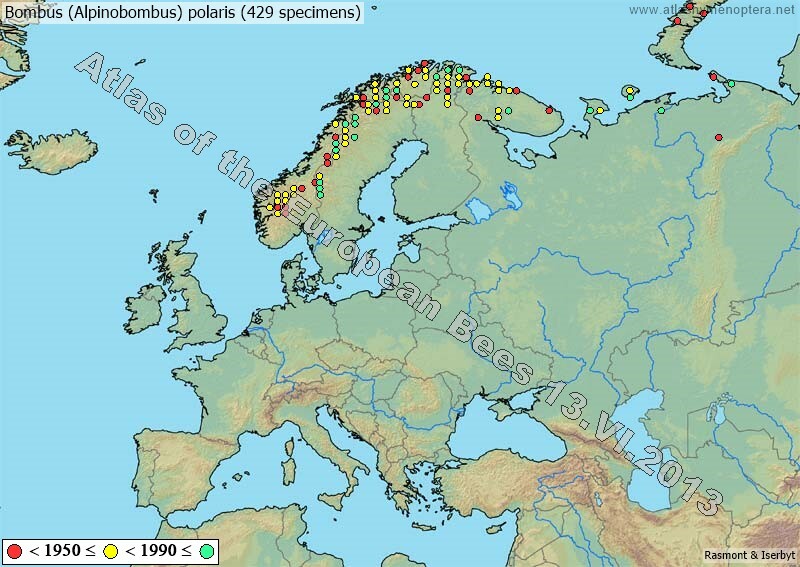 Bombus sichelii has never been observed in the N. European mountains, nor in Fennoscandia. Little is known on this strictly alpine species. It lives in the highest alpine steppes of Anatolia, Transcaucasia, Caucasus and N. Iran. Bombus mendax Gerstaecker is a high mountain species from the Alps and the Pyrenees, where it lives in the highest altitude levels. For this strictly alpine speciesof the high alpine steppes of Anatolia, Transcaucasia, Caucasus and N. Iran, still less is known than for handlirschianus. These two species are very similar, being only separated by their coat colour, and it is not sure that they desserve a species separation. Bombus barbutellus has a distribution extending from S.Spain (?) to the South to mid-Finland to the North and from Ireland to the West to Far-East of Russian to the East. It inquilines mainly B. hortorum, B. ruderatus and B. argillaceus but it is much rarer than its hosts. Most data are ancient. There are two subspecies that have been considered as two separated species by most authors. Lecocq et al. 2011 demonstrated that they are conspecific. The ssp. barbutellus is more abundant in the north of the distribution, while maxillosus occurs mainly in the south. Main sources : BDFGM; Intoppa et al., 1995; Rasmont, 1988; Reinig, manuscrit; Castro, 2010; Ricciardelli d’Albore, 1986; Manino et al., 2010; Anagnostopoulos, 2005; Ornosa Gallego, 1984; Monfaret et al., 2007. 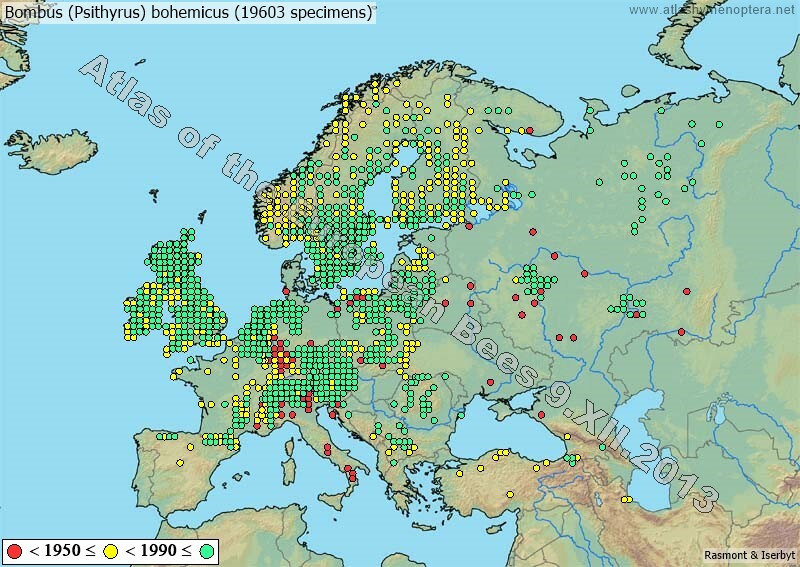 Bombus bohemicus is one of the most common cuckoo-bumblebees of Europe. It is widespread from the N. Spain, the S.Italy and the Balkan to the South to beyond the Arctic Circle to the North. It extends toFar East of Russia to the East. It inquilines mainly B. lucorum. 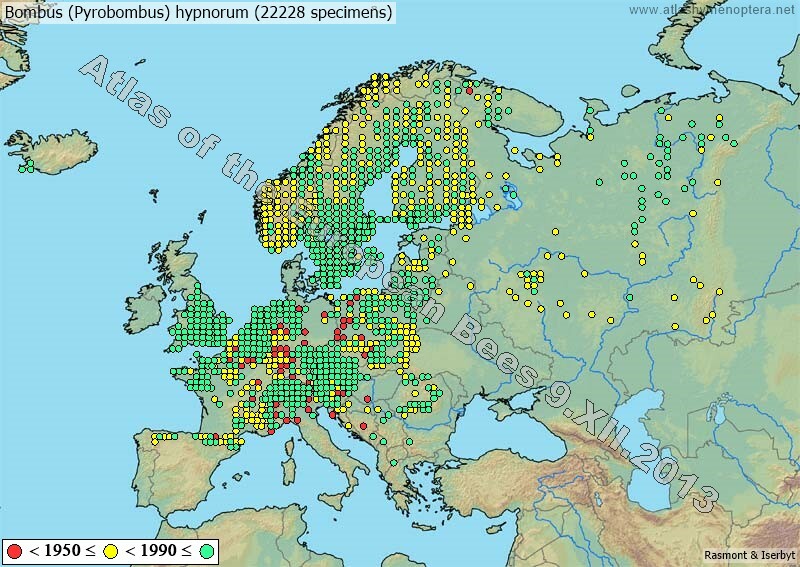 Bombus campestris is one of the most common cuckoo-bumblebees of Europe. It is widespread from the N. Spain, the S.Italy and the Balkan to the South reaching the middle of Fennoscandia to the North. It extends to the Far East of Russia to the East. It inquilines mainly B. pascuorum and other species of the subgenus Thoracobombus. Bombus perezi is endemic to Corsica and Elba islands. It inquilines very likely the very special local subspecies of Bombus terrestris. 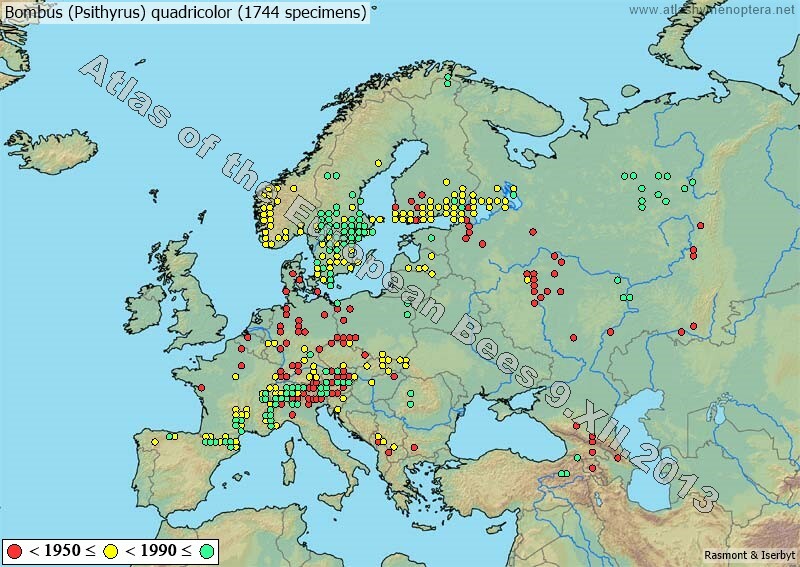 Bombus quadricolor lives from the Pyrenees and the Cantabrian to the South to the middle of Fennoscandia to the North. Its Oriental limit is not well known, likely in the Altai. To the West, it barely reaches the Atlantic coast, being absent from UK. It shows several subspecies with a somewhat intricated distribution and unclear status. It inquilines B. soroeensis. 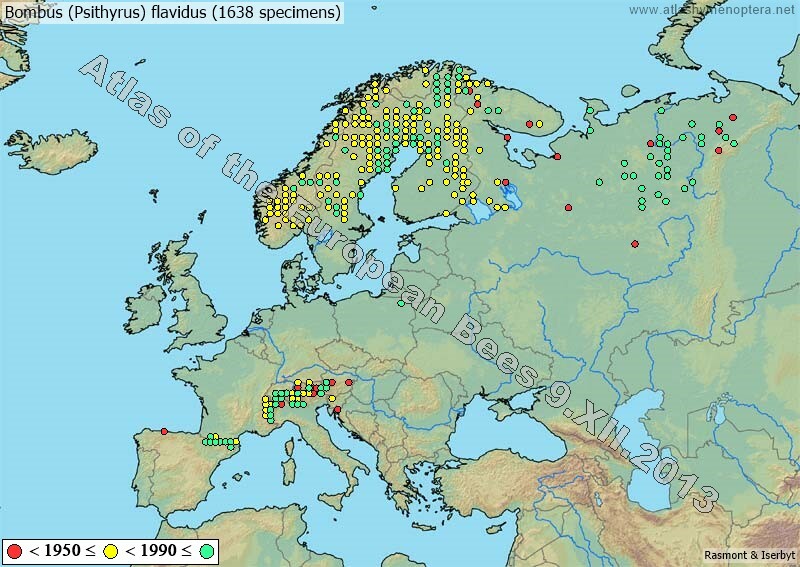 Bombus rupestris lives from the middle of the Iberian peninsula, the S. Italy and the Balkan to the South to the middle of Scandinavia to the North. It can be found from Ireland to the West to East Sibiria to the East. It inquilines mainly B. lapidarius but also B. sichelii and likely other species from the subgenus Melanobombus. Bombus sylvestris is the second most abundant cuckoo-bumblebee. it occurs from the middle of Iberian peninsula, S. Italy and Balkan to the South and crosses the Arctic Circle to the North. It can be found from Ireland to the West to the Far-East of Russia to the East. It inquilines mainly B. pratorum. Bombus vestalis if the most meridional cuckoo-bumblebee in Europe. It can be found from the North Africa to the South to the South of Sweden to the North. It lives from UK to the West to the N-Iran to the East. It inquilines mainly Bombus terrestris. Bombus brodmanicus is rather poorly known. This is mainly due to its quite singular distribution : two areas separated by more than 2500 km! The nominal subspecies lives in the western Caucasus, Armenia and NE. Anatolia. The subspecies B. brodmanicus delmasi (Tkalcu) is found in the south of the French Alps and in a few nearby Italian locations. Besides, their altitudinal range is restricted and even where they are present, they stay uncommon. In their western range, they feed on a very restricted array of plants and are active very early in the morning and at sunset. Furthermore, they are the smallest of West-Palaearctic bumblebees. B. cingulatus is found in the coniferous taiga, between the 60th and 70th parallels. More east, its range extends to the Pacific, where it is found along the coast down to the latitudes of Khabarovsk and S Sakhalin (ca 46°N). The limits of its distribution are rather poorly known, due to the common mistake between B. cingulatus and B. hypnorum. The range of the species is of the Pontic type, but its habitat is restricted to the rainy forest zones. It is found in Albania, E. Yugoslavia, Macedonia, Romania, Bulgaria, Greece, Turkey, the Caucasus, Armenia, Azerbaydzhan and N. Iran. It is mostly encountered in Bulgaria and N. Turkey, but common nowhere. It reaches the extreme south-east of the West-Palaearctic region in the Kopet-dag, at the border between Iran and Turkestan. It recently extended its distribution toward the west, reaching now Croatia, Slovenia, Slovakia and Austria (Jenic et al. 2010). Since the recent distinction between Bombus lapponicus s.s. and B. monticola (Svensson, 1979a; Pekkarinen, 1982), most of the older data are obsolete. As B. monticola is absent from N. Russia and N. Siberia, we may assume that the ancient data from these region are about B. lapponicus. The range of the species extends approximately between the 65th and 70th parallels in Europe and the 60th and 72nd parallels in Siberia. It extends from the north of the taiga to the tundra, except for its colder parts (Taymyr peninsula). In Fennoscandia, the ranges of B. lapponicus and B. monticola will remain questionable, as long as the material studied by Løken (1973) has not been revised. According to Svensson (1979a, 1980), B. lapponicus is found throughout the mountains of Fennoscandia to the Atlantic coast of Norway. According to Pekkarinen et al. (1981), who take both species in account, B. lapponicus is found from the northern shores of the Bothnia Gulf, at 65° N, to the shores of the Barents sea. Bombus modestus is a taiga species, like B. cingulatus, B. sporadicus, B. semenoviellus, B. schrencki and B. patagiatus. However, it is far less common than these and is, indeed, among the rarest and less known species of the West-Palaearctic region. 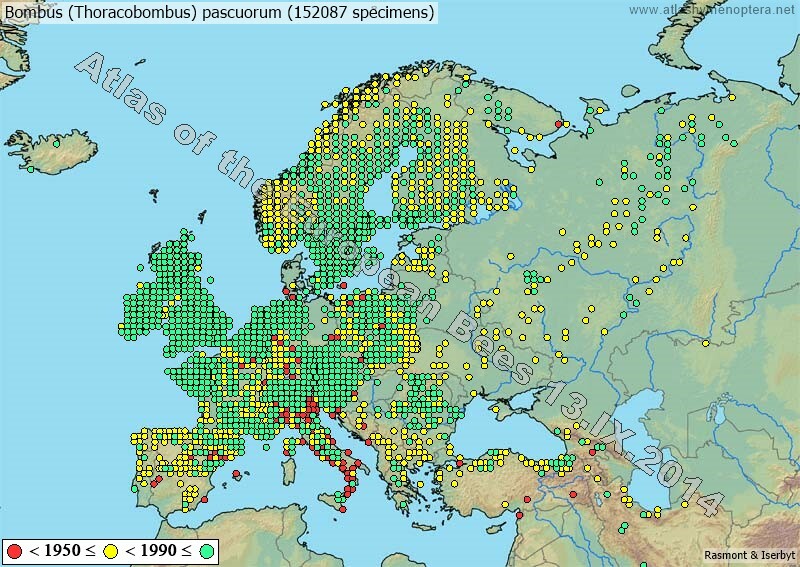 Only few specimens have been collected in Europe. More east, it is known from western Siberia to Far-East to the East. As Bombus monticola is widespread in most of the mountain ridges of Europe (fig.BMON) and as its attractive coat colours make it quite conspicuous, it is often mentioned in the literature, mostly under the name "lapponicus". The recent separation between B. monticola and B. lapponicus s.s. makes the interpretation of these older data rather difficult (Svensson, 1979a; Pekkarinen et al., 1982). Up to now, B. monticola has not been observed out of Europe. In the north of the continent, it lives in the mountains of Scandinavia and down to the sea level in the north of Norway and the Kola peninsula. In Finland, it is only found in a few places along the Norwegian border (contrary to B. lapponicus s.s., which extends south to the Gulf of Bothnia) (Pekkarinen et al., 1981). The populations from Fennoscandia belong to the ssp. scandinavicus Friese. The rather dark populations from the British Is. belong to the nominal subspecies. The populations from the Alps and the Balkan belong to the ssp. alpestris Vogt. The ssp. rondoui Vogt lives in the Cordillera Cantabrica and in the Pyrenees, the ssp. konradini Reinig, in the Appennino Mts. Both subspecies are specially light and colourful. Bombus pratorum is one of the most widespread bumblebees of the West-Palaearctic region. It is one of the most common species after B. pascuorum, B. terrestris and B. lapidarius. Its range extends from the shores of the Arctic Ocean to very close to those of the Mediterranean. Although B. pratorum is very common and almost ubiquitous in central Europe and at higher latitudes, in the south, it is clearly a mountain species. It is uncommon and very localised in the south of the Iberian peninsula, Italy and the Balkan. In Anatolia and Iran, it is found only in the northern mountains. It is absent from the steppes of Ukraine and S. Russia but present in Crimea. East of the Ural, it is found by places in W. Siberia and in the Altai, but does not extend east of the Ienissei. One could recognize the ssp. skorikowi from NE Turkey and Caucasus, and the spp. santonae from the Iberian peninsula. All other subspecies seem unconsistent. IMPORTANT DATA SOURCES FOR THE BALKAN ARE STILL MISSING ON THIS MAP (24.XII.2010). Bombus pyrenaeus is restricted to the high mountains of central and southern Europe, between the 40th and the 50th parallels. It shows conspicuously different subspecies among Pyrenees (ssp. pyrenaeus), Alps (ssp. tenuifasciatus), Tatras (ssp. afasciatus), Carpathian, Balkan (ssp. balcanicus). The range of Bombus niveatus vorticosus is centred around the Aegean Sea. This subspecies is specially common in the Balkan (Montenegro, Kosovo, Macedonia, Bulgaria, Greece) and in W. Anatolia. It has also been found in Crete, on Cyprus, and in the mountains of Lebanon and W. Syria. It is much less common in Anatolia, Caucasus and N-Iran where it is mostly replaced by the nominal ssp. niveatus. Most authors separate B. vorticosus from B. niveatus as good species. Nevertheless, Rasmont et al. (2005) shown that they are conspecific. While the yellowish ssp. vorticosus s.s. occurs on both sides of the Aegean, the ssp. niveatus only occurs in near Asia. The remark of Radoszkowski about its discovery of this species on the Ararat mountain appears as poetry : "Cette espèce doit appartenir aux espèces très anciennes parce que le sommet du Mont Ararat, d'après les traditions, n'a pas été submergé pendant le déluge". [This species should belong to the most ancient ones while the summit of the Ararat mountain, after traditions, has not been submerged during the Flood] O. Radoszkowsky (1890). The distribution of B. sulfureus is restricted to the higher mountains of central Anatolia and N. Iran. The species is rare and difficult to catch due to its shyness and its very fast fly. In the West Palaearctic region, the range of B. distinguendus spans from the 45th parallel to hardly beyond the Arctic Circle. The most southern observations are from the French Jura Mts., N. Lombardia (Italy) and a few places in the south of the Carpathian Mts. (Romania). The location in Croatia, cited by Handlirsch (1888), is dubious. The species is generally uncommon. As it is also regressing, most places of the map relate to old observations. More east, it can be found throughout Siberia, to the Ussuri R., the Kamchatka, Sakhalin Is., Mongolia, Inner Mongolia, the Altai and the Sayan Mts. According to N. Bogatyrev, it is common in W. Siberia, around Novosibirsk. As B. fragrans is the tallest bumblebee of the West-Palaarctic and it is easy to recognise. It extends from Lower Austria in the west to Inner Mongolia in the east and from the regions of Kazan (Russia) and Moscow to the Great Taurus in Anatolia. In Europe, its distribution is discontinuous, with a western isolate in Lower Austria and Hungary and an oriental zone in the Ukraine. The species is uncommon. The distribution of B. melanurus in the West-Palaearctic region is restricted to E. Anatolia, Armenia and N. Iran. Handlirsch (1888) mentions a place "Waga" in the Caucasus, but this toponym has never been localised and the presence of the species in this region was never confirmed. More east, B. melanurus is present in the Alai, the Pamir, Cashmere, the Altai Mts., Inner and Outer Mongolia and central China. The distribution of B. subterraneus is very wide. However, as its population densities are generally low, it may be locally overlooked. In the west, it has been found in the north of the Iberian peninsula, in the Pyrenees and the Cordillera Cantabrica. In the British Is., it is restricted to England and a few places in Wales. In Fennoscandia, it is found in many places up to the 60th parallel. It is found in every country of western and central Europe, but in the Mediterranean regions, it is restricted to the montane stages. It is found throughout Italy, but always in the mountains and not in Sicily. In the Balkan, it extends south to the Olympus and Pilion Mts. In eastern Europe, the species has been signalled in Estonia, Lithuania, Belarus, Ukraine, Romania and, in Russia, up to the 60th parallel. Panfilov (1957) mentions it in the Krim, the Caucasus, the south of the Ural Mts., S. and E. Kazakhstan, the Tien Shan Mts., the Altai, the Baykal'sk and N. Mongolia. In Asia Minor, it has been encountered on the Anatolian plateau, in Transcaucasia and N. Iran. The darker forms (ssp. subterraneus) are restricted to S. Scandinavia and to Switzerland, N. Italy and S.-E. France. The light-coloured forms (ssp. latreillellus) are found elsewhere. B. subterraneus latreillellus has been introduced in New Zealand, where it is restricted to the South Island and remains much less common than the other imported species. Bombus armeniacus belongs to the pomorum-group (formerly sg. Rhodobombus). The range of B. armeniacus is restricted to true steppes. It extends discontinuously from the surroundings of Vienna (Austria) to the West to Ulan-Bator (Mongolia) to the East and from the Mazandaran (N. Iran) to the surroundings of Kazan, in the Volga basin (Russia). A very isolated population is found in Burgenland and Nieder-Österreich (Austria) and S. Moravia (Czechia). Another, larger population thrives in Bulgaria. One specimen is mentioned from Rijeka (Croatia) by Pittioni (1938a), but this may be a mistake. Two specimens were collected in S. Macedonia. Curiously enough, the species is not mentioned from Hungary nor from Romania. It is found in Ukraine, in the Krim and in the lower valleys of the Dniepr and Don Rs. In European Russia, it is particularly present in the Volga valley, between Kazan and Volgograd. More east, it is found in Bashkiria and in the surroundings of Novosibirsk. In N. Anatolia, the Caucasus, Transcaucasia and N. Iran, it is quite common. More east, it is widely spread in the Alai, the Altai and in the upper Ienissei valley. Isolated specimens have also been found near Irkutsk and Ulan-Bator. A subspecific differenciation has been suggested but is barely visible. Bombus brodmanni belongs to the pomorum-group (formerly sg. Rhodobombus). This is a very rare species with a questionable status. The nominal subspecies lives in N.-E. Turkey, from Erzincan to the Ararat Mt. and in the west of the Caucasus, in the regions of Teberda and of Mt. Elbrus. The ssp. denesi, from W.Anatolia, is presently known only through its holotype. The distribution of B. deuteronymus is very discontinuous. The ssp.bureschi is found in Croatia, Bosnia, Serbia, Bulgaria and Romania. This subspecies is very uncommon and no more than a score of specimens have been observed. The West-Palaearctic region distribution of ssp. superequester is restricted to Russia, between the 53rd and 59th parallels. Because of the high probability of mistakes, many observations of "subbaicalensis" from Russia cannot be reliably related with a precise species. They may belong as well to B. humilis subbaicalensis, to B. deuteronymus superequester, to B. veteranus or to B. pseudobaicalensis. For this reason, only the observations of Skorikov (1922a), and Kazanskii (1925) as well as our own ones have been included in map. The nominal subspecies lives in eastern Siberia, Mongolia, the Ussuri basin and Japan. The distribution of Bombus inexspectatus is confined and discrete. The species lives in the Cordillera Cantabrica and on the southern side of the southern Alps. It is also likely present in the Pyrenees, although no valid observation has yet been reported from these mountains (the specimens reported by Ornosa Gallego, 1984, have all been invalidated and revised as ruderarius by L. Castro). This distribution is clearly relict. B. inexspectatus is very uncommon : Yarrow (1970) reports 36 specimens only among a sample of 10000 bumblebees collected in its Cantabrian locations. Quite clearly, in the absence of such thorough samplings, the species will remain undetected. B. inexspectatus is a workerless species that inquilines B. ruderarius. Bombus laesus belongs to the laesus-group (formerly sg. Laesobombus), together with the near species or subspecies Bombus mocsaryi. Depending on the authors, these two species are separated or lumped together as subspecies of the same taxon laesus. As the queens and workers of laesus s.s. very closely recall those of B. muscorum, to the point that they can be undistinguishable, one should rely only on the males in the region where these species co-occur. Bombus laesus s.s. is present in S.-E. Poland, Hungary, a few isolated specimens in Serbia and Macedonia, in Ukraine, the Volga basin, Kazakstan, the Caucasus region, Anatolia and N.-W. Iran. Within this wide range, the species is common only in some rather restricted zones, as Hungary and the region extending from Turkey to Iran. The steppic distribution of Bombus laesus laesus reminds of that of an other steppe species: Bombus fragrans. Bombus mesomelas belongs to the pomorum-group (formerly sg. Rhodobombus). Within the West-Palaearctic region, Bombus mesomelas is a species from the southern mountains. Bombus mesomelas mesomelas is found in the Cordillera Cantabrica (Spain), the Pyrenees, the Alps, the Appennino Mts., the Tatras Mts., the Krkonoše Mts. (Czechia) and the Carpathians. The range of Bombus mesomelas alboluteus is discontinuous, with a western population in the mountains of S. Bosnia, Yugoslavia and the Balkan and an eastern population in E. Anatolia, the Caucasus, Transcaucasia and N. Iran. In the north of its range, mesomelas has been found in the hills and lower mountains of Thüringen (Austria), S. Poland and Bohemia (Czec Republic). All these findings are ancient. In the Cordillera Cantabrica, the Pyrenees, the western and central Alps, the species is quite common. 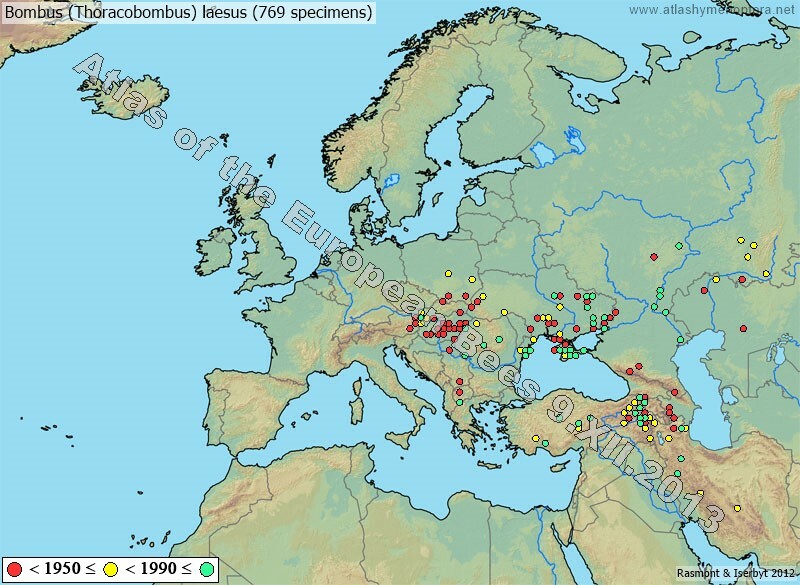 On the contrary, in the eastern Alps and in the mountains of central-east and eastern Europe, as well as in Iran, mesomelas is uncommon and its distribution is patchy. The nominal ssp. of Bombus mlokosievitzi lives mainly in the mountains of NE. Anatolia, but some specimens have been encountered in the north-west of this region. The ssp. vogtiellus is found in the Balkan Mountains, in Macedonia, Greece and Bulgaria and in the mountains of N. Anatolia, from the Bursa region in the west to the surroundings of Erzincan in the east. The ssp. convergens lives in the Caucasus. In Anatolia and seemingly in the Caucasus, Bombus mlokosievitzi is common. It is always uncommon in the Balkan. 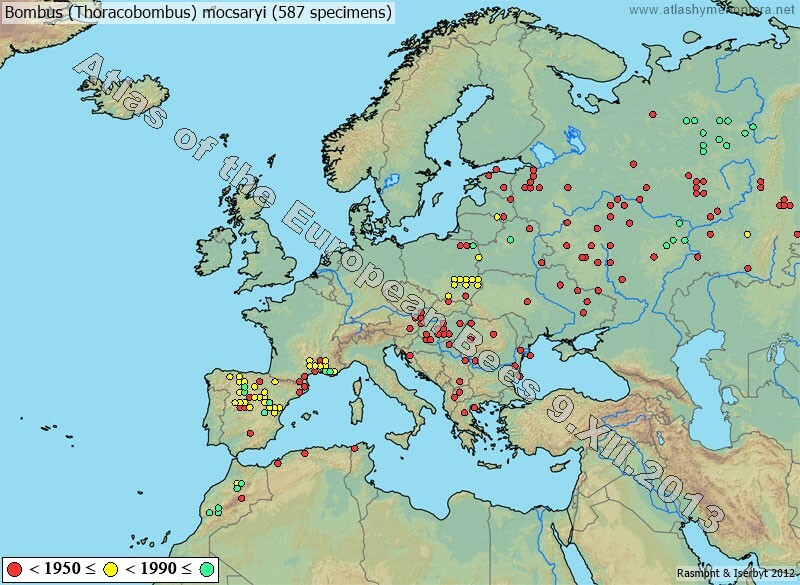 Bombus moscaryi belongs to the laesus-group (formerly sg. Laesobombus), together with the near species or subspecies Bombus laesus. Depending on the authors, these two species are separated or lumped together as subspecies of the same taxon laesus. Bombus mocsaryi is very widely distributed: N. Africa (Morocco, Algeria and Tunisia), Spain, S. France, E. Austria, Hungary, Poland, Baltic states, Belarus, N. Ukraine and Russia (mainly between the 50th and 60th parallels). 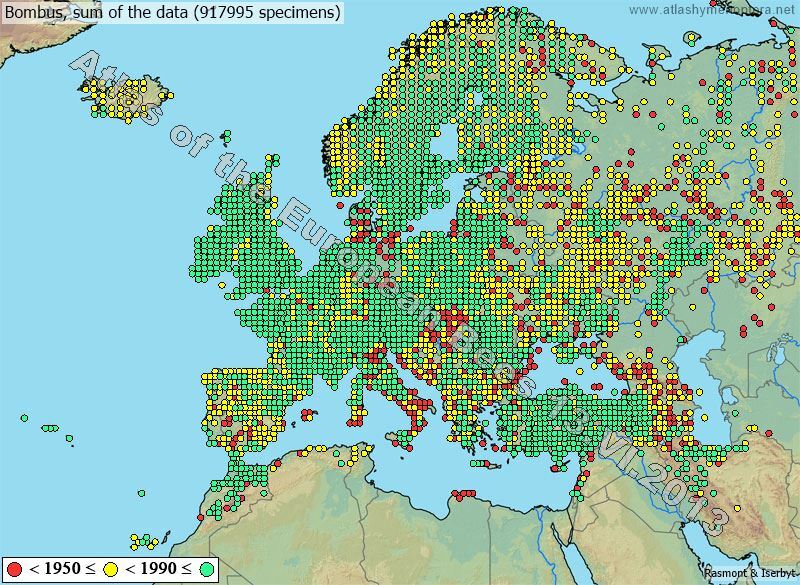 Scattered specimens have been collected in Croatia, Serbia, Macedonia, Greece and Romania. Curiously, the species is known neither from Italy nor from Bulgaria. There is a gap between the western populations (Spain, France and N. Africa) and the populations from E. Europe. More east, B. mocsaryi is found here and there, from W. Siberia to the Pacific coast. Bombus mocsaryi does not occur in true steppe (contrary to laesus s.s.) but in wooded steppe or in dry open grassland. Bombus mucidus was considered formerly as a distinct subgenus (Mucidobombus). Bombus mucidus is restricted to the south European Mountains : Sierra Cantabrica, Pyrenees and western Alps for the ssp. mollis, rest of the Alps, central Appennino Mts, Balkan mountains (Bosnia, Crna Gora and Macedonia), central Carpathians for the ssp. cf. mucidus. The ssp. pittioniellus, of yet unsettled status, is restricted to the mountains of Crna Gora and Macedonia. The local density of B. mucidus is highly variable. In some mountains e. g. in the eastern Pyrenees, it may be quite common whereas it is very rare in a large part of the Austrian Alps. Bombus muscorum muscorum, B. m. bannitus. 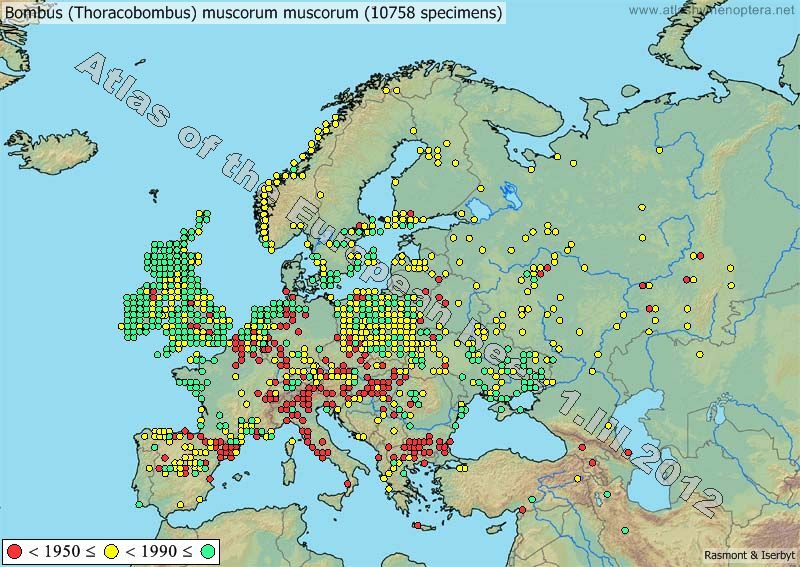 The distribution of Bombus m. muscorum is remarkably wide. The species is found from Ireland to Mongolia and from the latitude of Stockholm to Crete. The northernmost location of the subspecies is in the surroundings of Vyborg, in Russian Karelia and in Orkney Islands. More north, we find B. muscorum bannitus. B. muscorum is generally uncommon to very uncommon in all its continental locations. On the contrary, it may be quite common in its maritime locations, specially along the Atlantic coasts. It is very uncommon in the southern half of the Iberian peninsula and the south of Italy and utterly uncommon in Turkey, the Caucasus and Transcaucasia. It has never been encountered in S. Greece nor in N. Africa, nor in Iran. B. muscorum muscorum includes several local variations in pilosity lenght that are often taken as subsp. (sladeni from England, agricolae from Orkney islands, laevis from Turkey). Bombus muscorum bannitus is a strictly coastal subspecies throughout its western distribution. Its highest observation is at 330 m, in the Scottish Highlands (Richards, 1935). It includes a serial of more or less conspicuous local variations often taken as subspecies (allenellus from Aran island, scyllonius from Scilly, liepetterseni from W-Norway, bannitus s.s. from N-Russia). 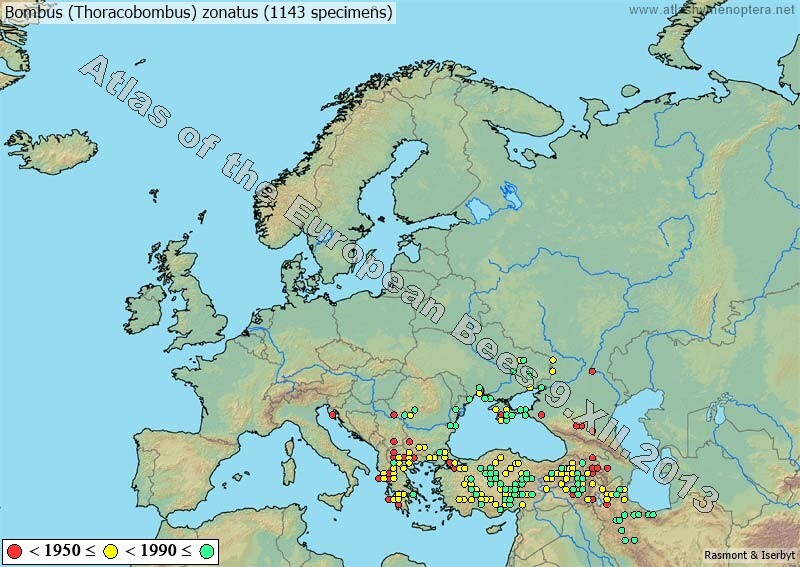 The specimens reported from E. Anatolia, the Caucasus and Transcaucasia are always isolated workers and it is not unlikely that they are, indeed, faded B. laesus workers. Bombus pascuorum is, by far, the most abundant bumblebee species in the West-Palaearctic. Its distribution is very wide. Northwards, it avoids the true tundra and it is absent from the Arctic islands, as well as from Iceland, the Orkneys, the Shetlands, the Hebrides and the Faeroes. Southwards, it avoids steppic as well as warm Mediterranean surroundings : it is absent from the south of the Iberian peninsula, of Italy and of the Balkan. It is found in Corsica and Sicily, though not in Sardinia and it is absent from the other large Mediterranean islands. It is also absent from N. Africa, Syria, Lebanon and Israel. Eastwards, it avoids the steppic regions of S. Ukraine, S. Russia, Anatolia and Iran but extends in Siberia to the Baikal region and S.-W. Yakutia. Bombus pascuorum includes as much as 23 subspecies ( pascuorum; melleofacies; intermedius; dusmeti; bofilli; maculatus; freygessneri; rufocitrinus; rufostriatus; septentrionalis; siciliensis; vulgo; floralis; gotlandicus; pallidofacies; paphlagonicus; rehbinderi; mniorum; smithianus; moorselensis; olympicus; sparreanus; taleshensis.). They are often brightly coloured and conspicuously different. In most of its area, the species is quite common. In the Mediterranean region, it is confined to the forests, the irrigated fields and some urban surroundings. Bombus pereziellus is strictly endemic to Corsica. Its phylogenetical relationships with muscorum are unclear. Bombus persicus was considered formerly as a distinct subgenus (Eversmannibombus). 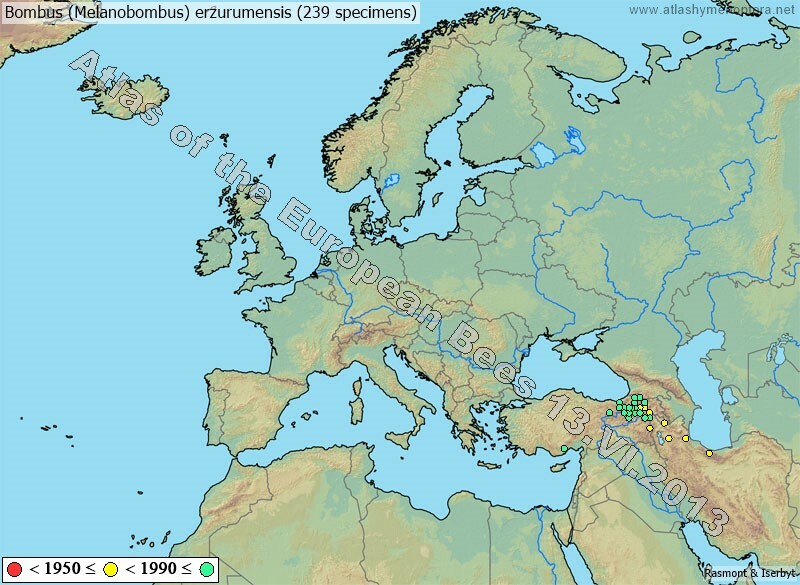 Bombus persicus lives in the Near-East mountains : Caucasus, Georgia, Azerbaydzhan, Anatolia, Armenia, N. Iran. Most of this range belongs to the ssp. eversmanniellus the ssp. persicus being restricted to N. Iran. Bombus pomorum belongs to the pomorum-group (formerly sg. Rhodobombus). 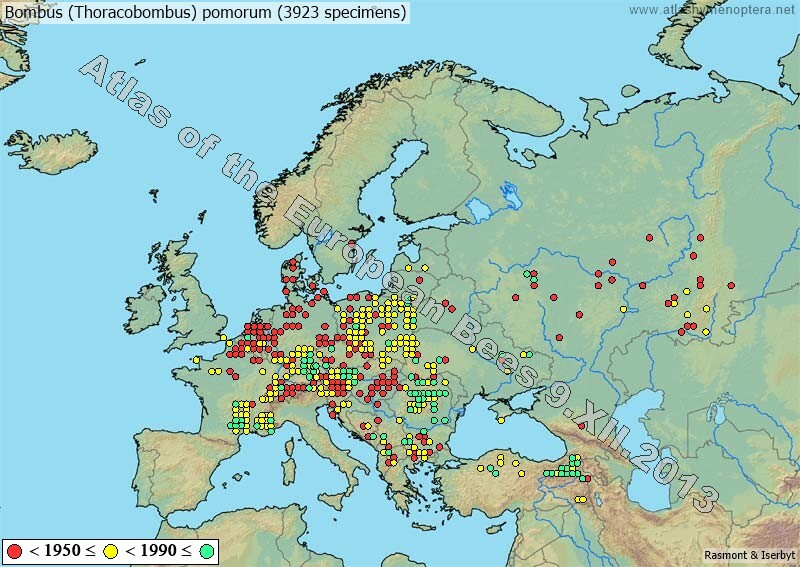 B. pomorum pomorum lives in the plains and hills of West and Central Europe and W. Anatolia. The subspecies B. pomorum uralensis is found in the plains and the southern hills of the Ural region ; the subspecies B. pomorum canus in the subalpine and alpine steppes of E. Anatolia, Armenia and the Caucasus region. The distribution of B. pomorum pomorum is restricted in latitude. Its southern limits are: in Massif Central (France), in N. Greece, and in N. Anatolia. 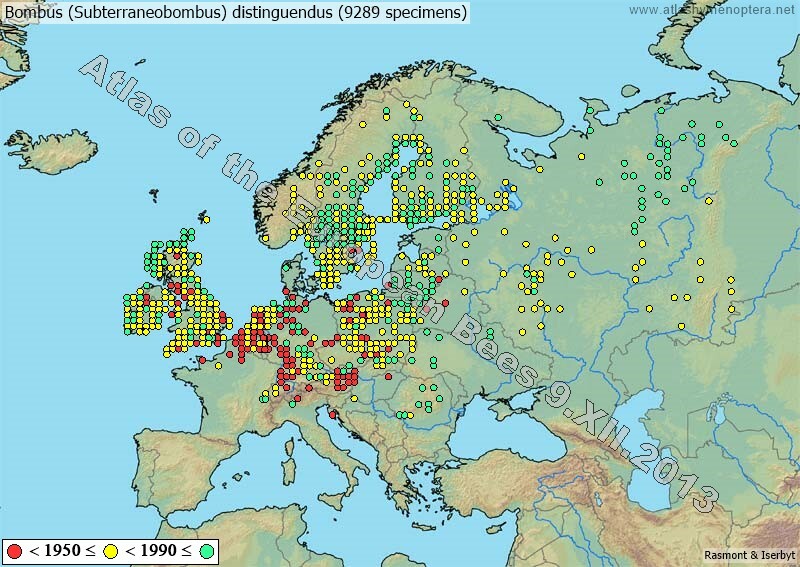 The most northern findings are from the Danish Jylland, with one ancient location in S. Sweden, southern Latvia and, in Russia, the Novgorod and Molotov (Ural) regions. In longitude, the subspecies ranges from Normandy (France) to the Perm region (Russia). Only one specimen is known from the British Is. and it has never been caught in the Pyrenees. All the southern locations are in the mountains ; many northern ones are ancient. 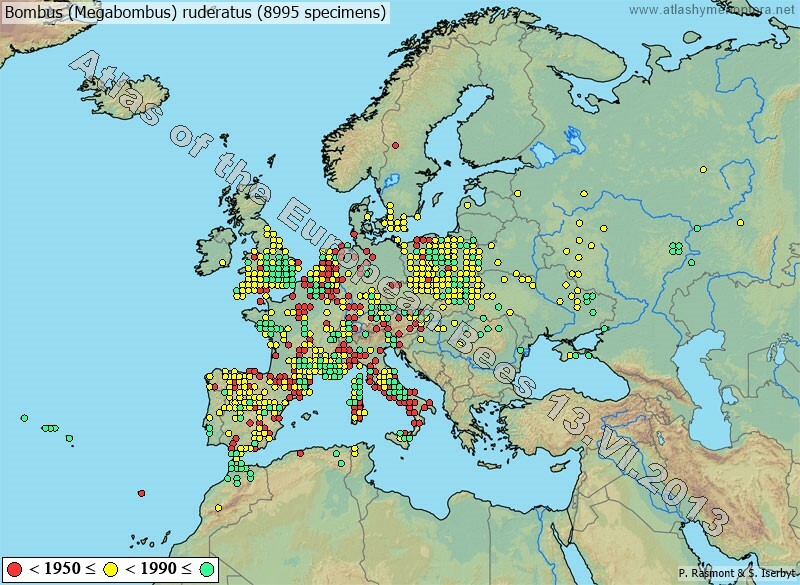 The range of Bombus ruderarius extends over a large part of the West-Palaearctic region. In the Iberian peninsula, it is found in the northern mountain ridges, where the form montanus coexists with the nominal subspecies. The nominal subspecies is present in Ireland, Great-Britain and in Fennoscandia, around the Gulf of Bothnia, where it reaches the Arctic Circle. In Russia, the nominal subspecies and the form montanus are found, grossly, between the 50th and 60th parallels. The eastern limits of the species are in SW. Siberia and in the mountains of E. Turkestan (ssp. sartus). Southwards, the range of B. ruderarius extends to the south of the Italian peninsula and in the Balkan, to the Parnassos Mt. (Greece) without including, however, the Mediterranean littoral and the large Mediterranean islands. The subspecies B. ruderarius tunensis is endemic to E. Algeria and N. Tunisia. 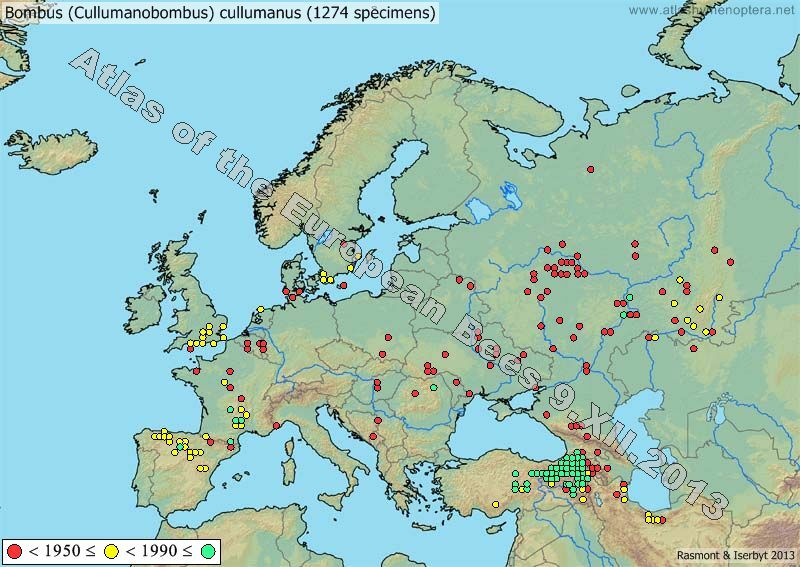 The nominal subspecies is found in W. Anatolia, whereas B. ruderarius simulatilis lives in the mountains of Anatolia, the Caucasus region and N. Iran. There appears to be a wide discontinuity between the populations of this region and those of the S. Russia plains. As it is for B. sylvarum, the distribution of B. ruderarius is patchy; ranging from very rare (as in N. Africa), to very common : in some places of the E. Pyrenees, the species may account for more than the half of all the observed bumblebees . B. schrencki is found from Wigry (NE. Poland) (Krzysztofiak, 1992) through the whole Russian and Siberian taiga, to the Pacific coast, Kamchatka, Japan, Sakhalin and Kuril Is. It could be a common species locally as Mänd et al. (1999) found B. schrencki profusely in several locations in Estonia, in natural surroundings as in cultivated areas. Bombus sylvarum is widely distributed in the West-Palaearctic region. It may be quite common and in some places, it is the predominant bumblebee species. West, its range extends in the Iberian peninsula to the parallel of Madrid. It is present in England, Wales and SE. Ireland but completely absent from Scotland. North, it extends in Fennoscandia to the 63rd parallel and in Russia to the 60th parallel. East, it hardly extends beyond the southern part of the Ural Mts., to Cheliabinsk. South-east, B. sylvarum is present throughout E. Anatolia, where it is present as its steppic daghestanicus form, in the Caucasus, Georgia, Armenia and NW. Iran. In the latter country, it does not reach the Mazandaran region. In the southern part of its range, B. sylvarum is clearly a montane species. It reaches the Etna in Sicily and the Taurus and Amanaus in Anatolia. In the Balkan, its limits are more northern : the mountains in N. Albania, Macedonia, Bulgaria and Pindos Mts., in N. Greece. It is absent from the large Mediterranean islands (except Sicily) and from N. Africa. Bombus sylvarum can be very abundant in some locations. Bombus velox is an uncommon species, even in its very restricted area. It has been ignored for long and has been the topic of few papers. The known range of B. velox is restricted to NE. Anatolia and the Caucasus. It is nevertheless not excluded that the species be discovered in the surrounding regions of Georgia, Armenia, Azerbaydzhan and Iran. 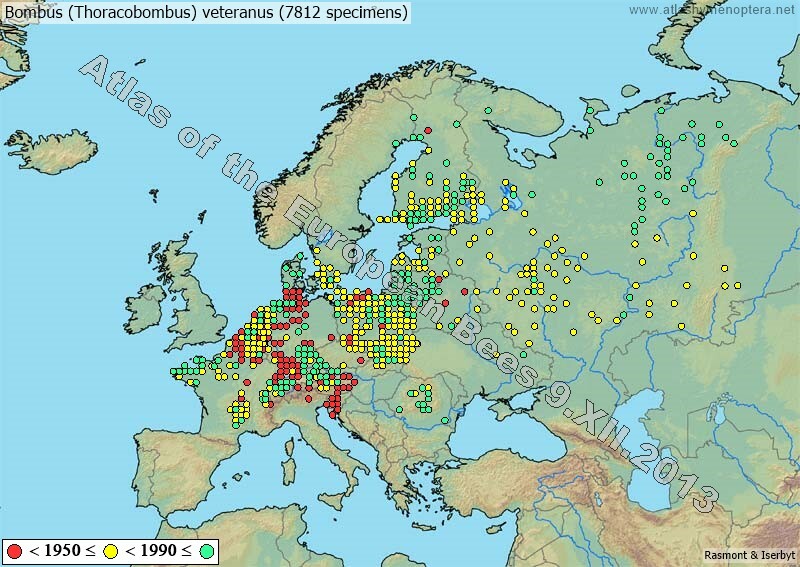 The distribution of Bombus veteranus is highly patchy. The species lives in the plains of N. Europe. The most southern confirmed observations are in the south of the French Massif Central, about the 44th parallel. 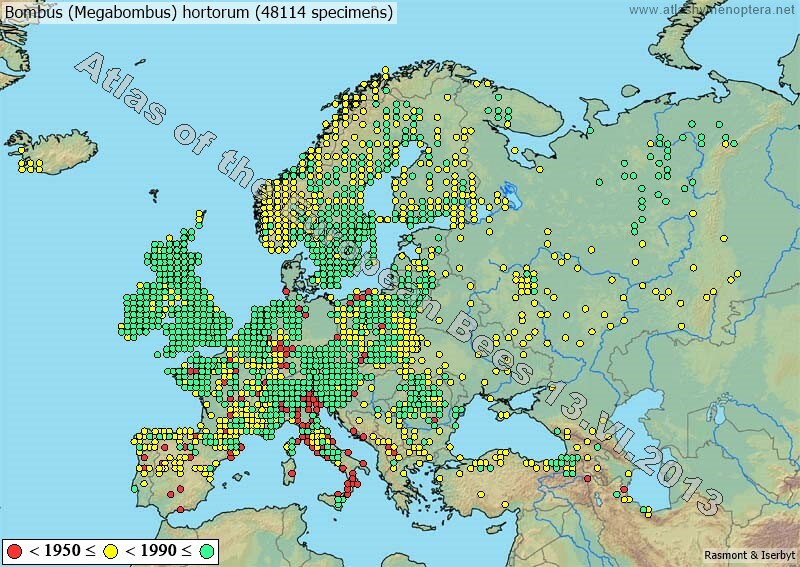 As some old data concerning locations in Italy are dubious as they refer to isolated and maybe wrongly identified individuals, Bombus veteranus has not been reliably reported south of the Alps and the Carpathians. West, B. veteranus reaches the coasts of French Brittany but not the British Is., nor the Pyrenees, nor the Iberian peninsula. North, B. veteranus does not extend beyond the 60th parallel, except in Finland where its range appears to be rapidly expanding. In Russia, it extends east to Irkutsk, including the Altai and the Sayan Mts. It is also present in N. Mongolia. Within this range, the very abundance of the species is highly variable in time and space. In most places, it is uncommon but it may abound in some, without any intelligible ecological reason. To give eamples, it was one of the most abundant bumblebees in Belgium one century ago, but it is now nearly vanished there. On the contrary, according to Söderman (1999) the species has recently become common in a large part of S. Finland. According to Voveikov (1953) B. veteranus is often inquiline of other Thoracobombus species, as B. sylvarum, B. muscorum, B. humilis and B. ruderarius. Bombus zonatus is common in Greece, Macedonia, Bulgaria, European Turkey, Anatolia, and Armenia. Some locations are reported from Albania, Romania, Crimea, Caucasus, Georgia, Azerbaydzhan and NW. Iran. The most northern locality known is near Volgograd (Russia). The most oriental populations (Anatolia, Transcaucasia, Caucasus, N. Iran) refeer to the ssp. apicalis, the other ones are from the nominal ssp. Alford D.V. 1975. Bumblebees. Davis-Poynter, London, 352 p.
Rasmont P., Terzo M., Aytekin M.A., Hines H., Urbanova K., Cahlikova L. & Valterova I. 2005. Pheromone analysis of the bumble bee subgenus Sibiricobombus Vogt suggests Bombus niveatus Kriechbaumer and Bombus vorticosus Gerstaecker are conspecific (Hymenoptera, Apidae, Bombus). Apidologie, 36: 571-584. Rasmont, P. & A. Adamski. 1995. Les Bourdons de la Corse (Hymenoptera, Apoidea, Bombinae). Notes Fauniques de Gembloux, 31:3-87. Skorikov, A.S. 1931. Die Hummelfauna Turkestans und ihre Beziehungen zur zentralasiatischen Fauna (Hymenoptera, Bombidae). Abhandlungen der Pamir-Expedition, 1928, 8: 175-247. Williams P.H., Cameron S.A., Hines H.M., Cederberg B., Rasmont P. . 2008. A simplifed subgeneric classication of the bumblebees (genus Bombus). Apidologie, 39: 46-74.